I never understood the needs for essential oils until I became a "pinhead" (Pinterest nerd) and almost all of the DIY recipes I've found require an essential oil to be added in order for the DIY product to be deem finished and ready for use (I follow ALL instructions and once comfortable with a recipe, I'll tweak it to my liking). I've learn that essential oils are a great staple to have in my home! "Essential oils can have a healing effect mentally, physically, and emotionally." After researching on the internet , I've gathered up a few different ways you can use Peppermint and Lemon Essential Oils to suit your beauty and homely needs. InstaNatural’s Peppermint Essential Oil is a multi-purpose oil that cools, energizes and refreshes the body and mind. This steam-distilled oil is extracted from dried or fresh leaves from the Mentha Piperita herb, giving it a sharp, menthol fragrance. Its pleasantly sweet and minty aroma makes it a premium choice for aromatherapy to improve the mind and lift the spirits. Dab on temples, neck, and sinuses to cure headaches. Natural pain reliever for toothaches. Aromatherapy: Peppermint is a great pick-me-upper which improves your blood circulation and awareness, leaving you feel energized. So far I've used the Peppermint Essential Oil in my tot's morning baths and last night to massage my Husband's back (he tends to get frequent backaches, pains, and sore muscles a lot). I am happy to report that my big man and little man enjoy this oil very much! It's funny and cute (sometimes) that my son is such a grump in the mornings lol! So for his morning baths, I put in a few drops of the peppermint oil and lemon oil. The aroma is quite refreshing and I have one happy and energetic baby afterwards. I can't wait to get my hands on the Lavender Essential Oil because that one should help put my son to sleep! For my husband's massage, I would mix a few drops of the Peppermint Oil with almond oil. I asked him for his feedback and he enjoyed the massage with the oils very much. The peppermint did wonders for him, his back stopped aching, he felt great relief and was energetic as well. Our Lemon Essential Oil is extracted from the rinds of lemon, which lends its fresh citrus fragrance. This cold-pressed oil has a strong bright scent that is both refreshing and uplifting. Its astringent and purifying properties also make it a great aid to help cleanse and tone the skin, while delivering a boost of Vitamin C antioxidant benefits. According to a pin I saw on Pinterest, this is a de-gummer! If you accidentally have gum in your hair, use some lemon essential oil to get it taken out! Lemons is a natural brightening/lightening agent. Add a few drops of the lemon essential oil to your favorite hair product, work into your hair, go outside, soak up the sun as your hair lightens up! Natural hair highlighter! Controls and banishes cold sores. Noticed I bolded the last bullet point... The Lemon Essential Oil kicked my Tea Tree Oil out of the ballpark when it comes to spot treating my pimples. My skin has been giving me hell because I had neglected to wash my makeup brushes (I know better... I know...). I LOVE the Lemon Essential Oil very much. It's a skin savior! I would dilute the Lemon Essential Oil with a few drops of water (use equal parts) and grab a Q-Tip to spot treat the random pimples on my face. Once you attack the zits with this remedy, your pimple should be gone by the next day!!! *high five* YES! I made sure to take note from what I had learned from research online that you should dilute the oils before applying them to your skin because the oil is heavily concentrated in its pure form and can potentially irritate your skin. Ideally, dilute the oils with a carrier oil (jojoba or almond). 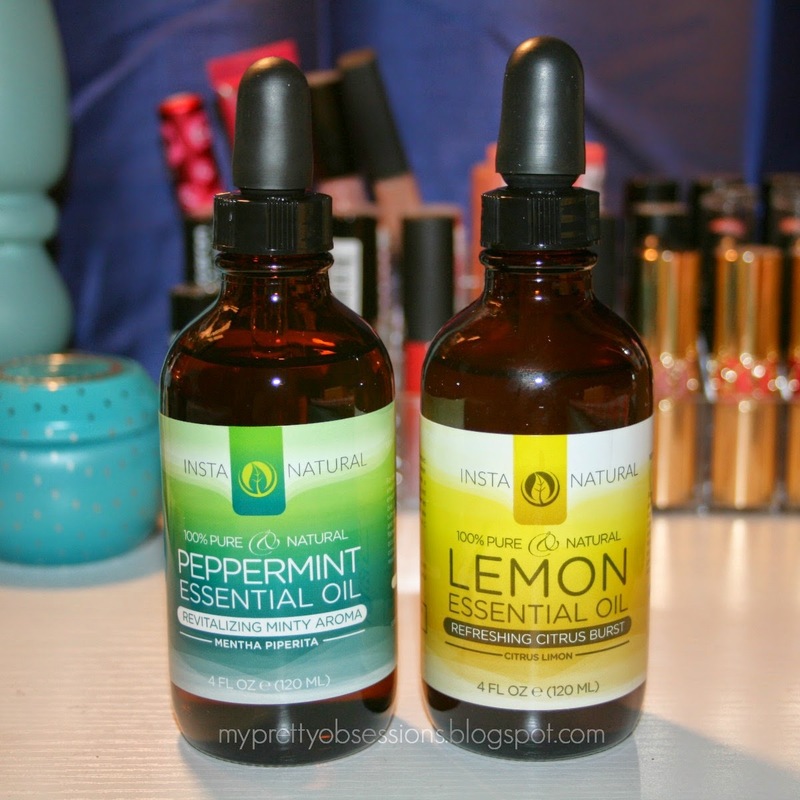 I'll be following up on this review and introduction on the Essential Oils by InstaNatural. I'm excited to try some more beauty DIY's and share with you my thoughts on the effectiveness of these oils! There are so many more things that you can use Peppermint and Lemon Essential Oils for, my blog post can get lengthy if I kept on listing all the things I found lol! Definitely Google your way through the internet or have fun browsing essential oils on Pinterest. I'm sure there's a beauty issue you may have that these oils can help remedy! You can purchase these oils from the InstaNatural website. You get 4 fl. oz. of product for $19.97 (U.S.D. before taxes and shipping). Are essential oils a staple in your household? What are your favorites and what do you recommend using these essential oils for?